Arthur Wood’s home, the Broken Angel. The Broken Angel’s creator faces eviction from his home of 34 years this weekend. A couple of weeks ago, two benefits for Arthur Wood took place and today NPR ran a segment about his story. The building was featured in the film Dave Chappelle’s Block Party, which follows the comedian as he puts together a free hip-hop concert in the Clinton Hill section of Brooklyn in 2004. “It’s a monument to Brooklyn, my dear,” Cynthia Wood, Arthur’s wife, explains to Chappelle. Chappelle is invited in by the couple, who look like time travelers from the Age of Aquarius. They named their home after a figurine they discovered broken and scattered in the street. Arthur put the pieces back together. The Woods bought the property in 1979 for $2,100 in cash. They gradually transformed the 19th-century brick building into what’s been hailed as a work of 21st-century art. 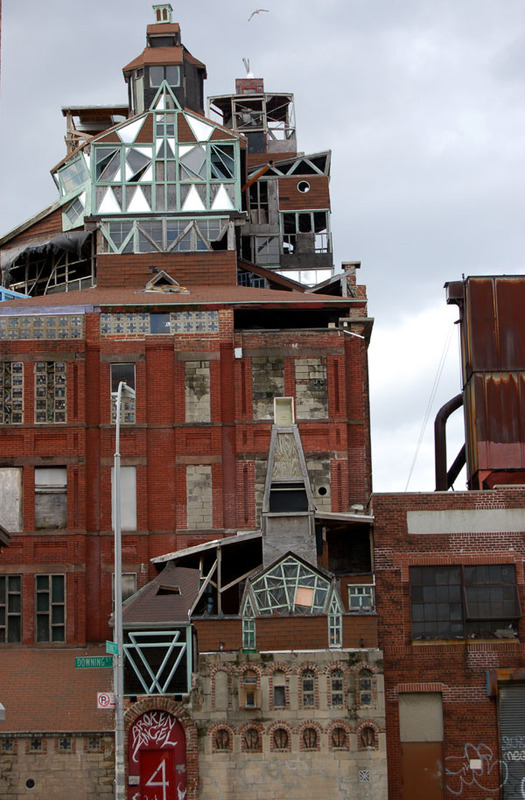 In its heyday, Broken Angel towered nine stories over the street. Arthur took out most of the floors, creating a soaring open space with stained glass windows. Thanks to Joel Rose for telling Arthur’s story. Here is hoping that because more people get to hear it that it helps Arthur in his fight. This entry was posted in events on March 29, 2013 by Carl Zimring. How do humans live in concert with the environment? Discuss this question in these two Fall 2013 courses. Fall 2013: Tuesdays, 2pm-4:50pm. 3 credit hours. In addition to that seminar, I am leading a team of Pratt Institute faculty teaching the third offering of SUST 201P The Sustainable Core. This course is designed as our introduction to sustainability and is an excellent way to get familiar with the many ways sustainability is practiced at Pratt. Fall 2013: Mondays, 2pm-4:50pm. 3 credit hours. Both of these courses may count as a Social Science or Philosophy elective, and there are no prerequisites for any of them. If you are a Pratt student and have any questions for me about these courses, please feel free to contact me at czimring@pratt.edu. This entry was posted in consumption, recycling, students, teaching, waste on March 28, 2013 by Carl Zimring. Thank you for inviting me to join you this evening. I am an environmental historian concerned with how we define and manage waste, and how those decisions affect the environment and society. My classes include The Sustainable Core, Production Consumption and Waste, and Power Pollution and Profit. In all of these classes, we consider how we create waste and how we might reduce waste in the future. One of the challenges is realizing that trash is more a verb than a noun. Nothing is innately trash; trash is a choice we have to dispose of all kinds of materials. What I like about this event is you are making your waste disposal visible. One of the major themes in the history of waste is how we have developed practices to make our waste invisible. When we classify packaging, foods, and other goods as wastes, we then put this unwanted items in a garbage can or even a recycling bin. Once they are in the can, our relationship with that material comes to an end. Someone empties that can into a dumpster or another can, then a truck comes along and takes the disposed materials away. Where? We might follow the truck, but few people are that curious. What’s important is the waste is taken out of sight and out of mind. It might have consequences, but we don’t see them. The only times we become aware of those consequences is when something is brought to our attention. Sometimes, this focus is environmental. Locally, litter on the sidewalk might bother us. Globally, we may be disturbed by media accounts of environmental damage. When Captain Charles Moore sailed his boat through the Pacific Ocean in 1997, he came across a mass of floating plastic debris. He discovered that this mass was larger than the state of Texas, and is one of several gigantic patches of plastic floating in the Earth’s oceans. This floating waste is killing several species of aquatic birds who mistake it for foods they can digest. The wandering albatross, the world’s largest bird of flight, may disappear in part due to this waste. The social cost to our waste management practices is also significant. Handling garbage and recyclables is dangerous work. Waste may include old detergent bottles or cleansers that damage lungs, eyes, and skin. Broken metal and glass can cause wounds. Even the equipment used to process wastes poses hazards. Last Saturday morning, Luis Camarillo was working at the Chambers Paper Fibres Corporation here in Brooklyn. He was loading paper into a truck when he fell in and was crushed by the truck’s hydraulic compactor. He was 18 years old. Unfortunately, stories like his are not rare. The waste trades have higher workplace accident incidence rates than the mining industry does. All too often in the United States, the workers who are hurt or killed are African American or Hispanic, because the most dangerous jobs in the trade are performed by African Americans and Hispanics. Most waste facilities in this country are located near or in African American or Hispanic communities. Our waste may go out of our sight, but it burdens other people and places. By keeping your waste in sight, you compel us to ask why we throw so much out of our lives and into vulnerable places. Thank you for doing this and thank you for inviting me to join you. This entry was posted in events, recycling, students, waste on March 22, 2013 by Carl Zimring. Earth Day is still a month away, but the Pratt Institute has green on its mind right now. (And not just because of St. Patrick’s Day.) Green Week 2013 is upon us, and here is a schedule (including action campaigns that start Monday). I’m participating in three related events. 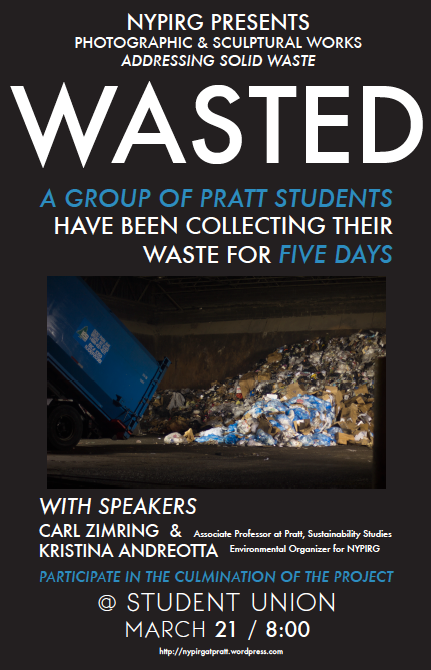 NYPIRG holds “Wasted” at the Pratt Student Union 8pm Thursday. Learn about the garbage we produce from students who will display the results of their disposal this week. I will make brief remarks. On Saturday, the Center for Sustainable Design Studies presents the third annual Sustainability Crash Course. I’ll discuss the history of upcycling aluminum at 11:15am. 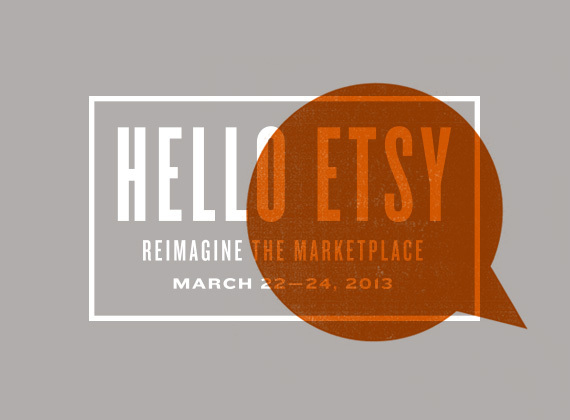 Friday, Saturday, and Sunday, Hello Etsy takes place at the Pratt Institute. I will moderate the “Reimagining Consumption” panel featuring Robin Chase of Zipcare, Michelle Long of the Business Alliance of Local Living Economies, and Karen Brown of the Center for Ecoliteracy Sunday at 9am. 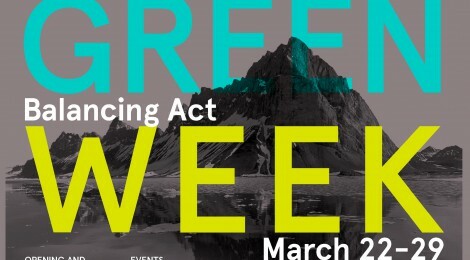 Consult the Green Week schedule for many events, activities, and campaigns around campus. This entry was posted in events on March 17, 2013 by Carl Zimring. Artist Arthur Wood has lived in his house for thirty-four years, using discarded material he found in dumps to transform it into a unique and legendary space known as the Broken Angel. If you rent the film Dave Chappelle’s Block Party, you can see the fruits of his labors. If you live in the Clinton Hill neighborhood of Brooklyn, you’ve probably met Arthur. If you walk down the block where Quincy dead-ends into Downing, you cannot miss the Broken Angel. Arthur Wood purchased the 4-story brick tenement building at 4-8 Downing Street in 1979 for $2,000. He lived in the house with his wife Cynthia and raised their son Christopher who is now a stone carver. The artist explored ideas about design and vernacular architecture with improvised construction to add new floors and rooms to the original building, to the point where the structure reaches 104 feet, or about 9 stories above the sidewalk. The site has been compared to Watts Towers in Los Angeles for the ad hoc construction and is acknowledged for its value as folk art and as part of the cultural heritage. Arthur is being evicted this week after a long legal battle to stay in his home. Tomorrow (on the Ides of March) a pair of benefits for Arthur are taking place. The first is an all-ages afternoon block party at the Broken Angel. The second, an after party, is a dance party fundraiser (21 and over) at the Irondale Center. Details on both events may be found at this Facebook page. This entry was posted in events, recycling on March 14, 2013 by Carl Zimring. I will moderate the discussion “Reimagining Consumption” on Sunday morning, March 24. For more about the conference, including ticketing, visit Etsy’s post about it. This entry was posted in consumption, events on March 13, 2013 by Carl Zimring. Watch this space for more details, but I will participate in Pratt’s 2013 Sustainability Crash Course on Saturday, March 23. Imagine being able to spend one amazing day immersed in learning about sustainable design—and meeting the people who have pioneered new thinking and practices. 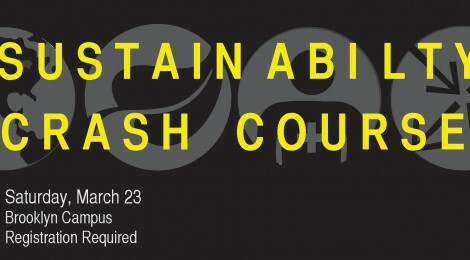 On Saturday, March 23, 2013, Pratt’s CSDS will present the third annual Sustainability Crash Course, a day-long series of workshops with a host of experts from Pratt’s sustainable design faculty and elsewhere. This will be great chance to hear experts discuss everything from Ecology and Biomimicry to Packaging Design and Life-Cycle Analysis. With over 20 speakers, it is sure to be a fantastic day of exploration and inspiration! My part of the program will consider upcycling in historical perspective. For more information, including how to register, see the Crash Course website. This entry was posted in events, history, recycling, teaching on March 7, 2013 by Carl Zimring.